When you’re a sprawling company like GE, you can make bizarre connections between your products. This time, they’ve found that tech from medical imaging makes wind power more efficient. 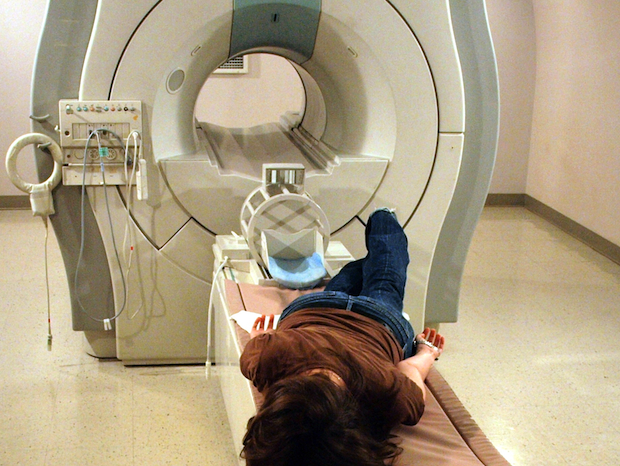 What do MRI machines and wind turbines have in common? They both can use superconducting magnets. It’s a discovery that GE made after decades of using the electromagnets (made out of coils of superconducting wire) in MRI machines, where they help create images of tissue inside the body. Now GE researchers have scored a $3 million Department of Energy grant to develop lightweight, cost-effective wind turbine generators that use superconducting magnets. And perhaps best of all, the magnets can replace the increasingly prized rare earth metals that are used in today’s generators. Electrical generators are a critical piece of wind turbine technology–they turn mechanical energy gathered from spinning turbines into electrical power. The more effective the generator, the more energy is turned into usable power. Wind turbine generators are often connected to gearboxes, which allow blades to move from low speeds to high speeds. They work well, but there’s a catch: they are heavy and require significant maintenance–two factors that make it more expensive to produce electricity as wind farms scale up. Companies like Siemens have started eliminating the gearbox altogether (with direct-drive turbines, but this requires the use of permanent magnets, which in turn need rare earth metals to operate. GE’s proposed generator cost-effectively eliminates the gearbox and increases performance. The superconducting magnets cut down on the generator’s size and weight, increase torque, and eliminate the use of rare earth metals–in this case, neodymium magnets doped with terbium and dysprosium–found in today’s permanent magnet machines. In layman’s terms: an MRI-magnet enabled wind turbine makes more energy, with easier to obtain materials. According to Keith Longtin, wind technology leader at GE Global Research, a four-megawatt generator in a direct-drive turbine today weighs about 85 tons. A 10- to 12-megawatt generator using superconducting magnets would weigh the same amount. put them 100 meters in the air on a pole that sways back and forth,” says Longtin. This isn’t the first time that GE has used research from other parts of its business in energy production. GE’s FlexEfficiency 50 natural gas power plant uses jet engine-inspired technology to efficiently scale up and down depending on the availability of renewable resources. “We make these kinds of connections all the time,” says Todd Alhart, communications program manager at GE Global Research.